Frank is a mid-level manager at a machining warehouse with three years of experience. He performs tasks enthusiastically and has received praise for his creative solutions for streamlining processes and procedures at his facility. Last week, one of Frank’s employees suddenly lost a close member of her family. Frank immediately extended his deepest condolences and asked how he could be of service to the employee. She responded with uneasiness about needing to immediately leave during her shift and take time off to fly home in order to be with her family. Without hesitation, Frank reiterated his concern and suggested the employee take the necessary time to be with her family. A few days later, Frank sent a small catering order to the family to help with the days leading up to the funeral. In order to complete the tasks at hand, Frank immediately made a slight adjustment to the shift schedule by calling in a part time employee and temporarily reassigning two important supervisory responsibilities so that he could personally oversee any extra responsibilities. Frank also communicated to his team that the employee would be out for a couple of days, gave them an overview of the operational adjustments, and made himself available for any questions. Do we respect Frank’s leadership approach? Of course! Why? You probably recognized from the passage above that Frank is a passionate and driven person that cares deeply for his job. In the way he handles a distraught employee, you can see he possesses the capacity for care, concern, and genuine understanding. Operationally, Frank possesses the characteristic of creativity, which allows him to use the competency of problem solving when a difficult situation arises. If asked, it would probably be a simple task to describe the reasons Frank is effective. You like Frank because you can easily recognize the importance of such characteristics and competencies in others. In upcoming posts, I will explore the importance of knowing our own Characteristics & Competencies, recognizing characteristics and competencies on our teams, and how we can develop these tools in our organizations. I’ll also delve into the concept of multiple intelligences; recently simplified by Cindy Wigglesworth who made the concept more accessible designating four recognizable categories. Time for a challenge: Ask yourself this question right now, “Who am I as a leader”? Take out a pen and paper (or open up a Word Document) and see if you can, in fewer than 5 minutes, write at least four sentences about your personal leadership characteristics and competencies. Were you able to speak comfortably and with conviction to who you are? If you are like most people, you probably found this question much harder to answer than the Frank question. As easy as it is to describe the traits of others, it is difficult for many to articulate their own characteristics and competencies. This is a familiar and challenging question that we all wrestle with from time to time. I find it to be an incredibly complex and personal area of reflection, which can easily lead to frustration if left unresolved. Can you relate to the response of my colleague? I certainly can. To be honest, I am envious of those leaders. My leadership journey has been one of peaks and valleys: successes paired with missteps, strong results mixed with mistakes, and the persistent feeling that I can do more. In pursuit of growth and to best support my teams, I chose many years ago to put pen to paper as you did just now, and to write down the words that best represent who I am as a leader. I found the result to be immensely helpful. So why does the question so often go unasked? Some of us don’t know what to ask. Introspection comes naturally to some and not so easily to others. It can feel a little scary to not know the answer to such an important question, which conceivably should be understood and applied when determining our principles and business approaches. The answer is already assumed. We lack understanding of the differences between leadership characteristics and leadership competencies creating confusion when we are attempting to articulate and define our identities. This will be the central theme of our discussion. Characteristics are intrinsic traits and speak to who we are and show up in our relationships and the way in which we relate to others. Competencies are learned skills and show up as the mechanical aspects of how we go about doing our jobs. 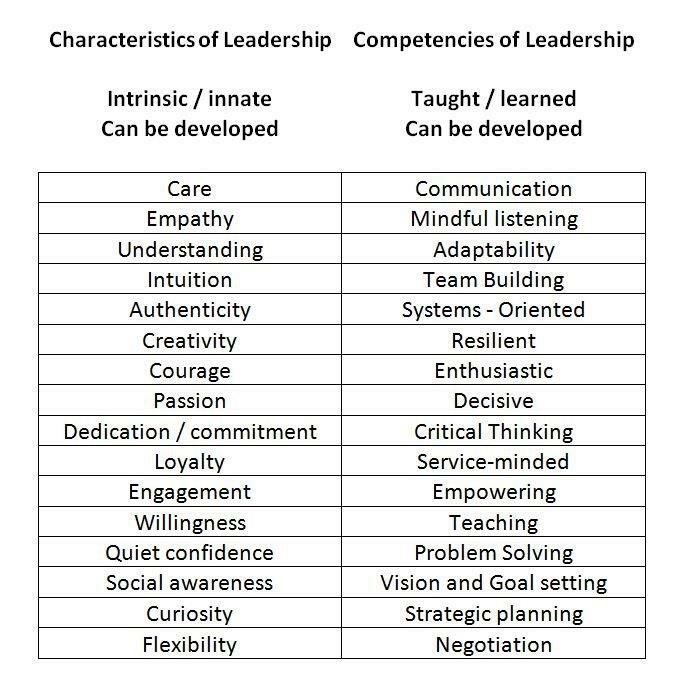 It is very important to note that although characteristics and competencies are very different and used in very different ways, both can be developed. Listed below, I have broken out some examples of characteristics and competencies. These groupings are in no way meant to represent all possibilities and should only serve as a roadmap towards helping create your own Cs and Cs list. As a point of interest, creating these lists can be a great training exercise connected to Team Member development or could be an excellent challenge for an existing group of leaders. Have your teams break into small groups and create a short characteristics and competencies list for each member. Five or so should work for each category, and instruct your teams not to second guess what naturally comes up for them. Encourage your teams to discuss the reasons for their choices in an open forum. If you chose to go further with the exercise, you can also discuss how the Cs and Cs are utilized and applied. What do we gain by better understanding who we are? Throughout my research, it has been exciting to discern how characteristics and competencies are essential underpinnings of who we are as leaders. I have also found them to be deeply interconnected to the concept of multiple intelligences. As previously mentioned, in upcoming articles we will further explore that connection. In doing so, we may find opportunity to refine our approach and modify processes to further optimize results. Lao Tzu said, “knowing others is intelligence; knowing yourself is true wisdom. Mastering others is strength; mastering yourself is true power”. I have found those words to be true. The more effort I put into self-discovery, personal growth, and learning, the better I am able to serve others. Enjoy the journey and…..Lead On!